Lil’ Tim (JQ, at center) hip hops along with his family, Mrs. Cratchit (Jackson Doran, left) and older sister Martha Cratchit (Postell Pringle, right) in Chicago Shakespeare Theater’s production of Q Brothers Christmas Carol, now through December 31. We can thank Evanstonian Rick Boynton, creative producer at Chicago Shakespeare Theatre (CST), for forging the alliance between Q Brothers Collective and CST. 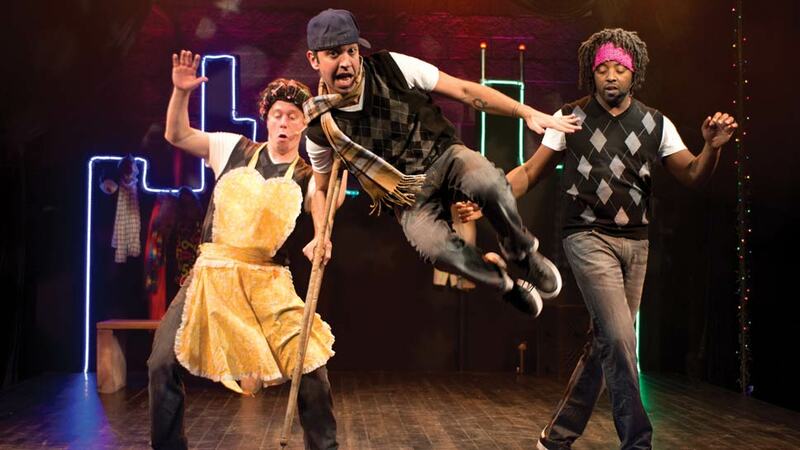 If you haven’t seen this hip hop sensation, be sure to catch their cheeky version of the Charles Dickens’ classic (back by popular demand, after three sold out runs in 2013, 2014, and 2015) now through December 31 at The Yard performance space. Q Brothers Christmas Carol features an irresistible score and a lot of heart. This feisty reinterpretation is underscored with beats spun live at the turntables mashing up styles from reggae and dancehall music to dubstep and epic rock ballads. And while you’re saving that date, be sure to check out Red Velvet, an award-winning drama that tells the true story of Ira Aldridge—the first black actor to take the London stage as Othello in 1833. Chaon Cross of Evanston plays leading actress Ellen Tree, who appears as Desdemona opposite Aldridge’s Othello in that play which opens on December 1 and runs through January 21 at CST’s Courtyard Theater. Chicago Shakespeare Theatre is located at Navy Pier in Chicago. For more information, visit chicagoshakes.com or call 312-595-5600.